This unique material, aerogel, is made by taking all the liquid out of silica. It has an extremely high R value but is extremely expensive. It is much easier to install than traditional fiberglass insulation. You can buy it in sheets that can either be nailed to the studs or there is a type that comes as a peel-and-stick application as well. This radiant barrier is good for the environment because it saves a significant amount of energy from lost in your space. Rigid Polystyrene, although a plastic, is considered good for the environment because of its super high R value. 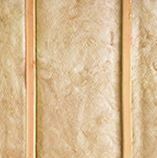 This insulation saves the most in energy usage. The R value of an inch thick piece is R-3.8 to R-4.4. This comes in the form of spray foam and another environmental plus is that it is a recyclable product. For more information on insulation, contact USI online to find a branch near you and get a free quote. USI believes that excellence in every step of the process and ensures timely completion and quality of service, time after time. ← How long does it take for spray foam to dry?